What are AVM and Brain aneurysm? Arterio Venous Malformation (AVM) is a congenital abnormality of the arterial and venous system simultaneously, in the brain, whereas, a brain aneurysm or medically speaking, a cerebral aneurysm is a segment of dilatation of the cerebral arteries in the brain. Both are mainly due to a defect in the formation of the blood vessels of the brain inside the womb. Normally, arteries drain into capillaries which then drain into veins. However, in AVMs, capillaries are not present and arteries are of weak musculature, thus there is direct and forceful flow of blood from arteries to veins making the veins dilate. No cause for the abnormality in the vessels is known. Symptoms of neurological dysfunction occur if there is haemorrhage, seizure disorder or decreased blood flow in the adjacent area due to AVM. In cerebral aneurysm, the segment of the arteries of brain is dilated. The cause of Cerebral aneurysm is 80% genetic. Other causes include hypertension, atherosclerosis due to increased cholesterol, head injury, malignancy, infection, other vascular disease, cigarette smoking, alcohol consumption, drug abuse, and AVM. Slowly, the dilated vessel may keep expanding and eventually rupture leading to haemorrhage within the brain. The dilated vessel may also compress the adjacent areas of brain causing neurological deficits like difficulty in speaking, seeing, etc . AVMs are clinically silent with no symptoms, until later in the disease when it presents as haemorrhage, seizure disorder or a neurological abnormality when the patient presents with headache which is severe and may come periodically like migraine or seizure. On the contrary, Cerebral Aneurysm may present with wide range of symptoms depending on the location and type of aneurysm. It may cause repeated headache which patient refers to as “the worst headache of my life”, pain around eyes, facial pain, confusion, decreased alertness, convulsion, neck pain, stiffness, alteration in sense of smell, vision, weakness, language disturbance and hormonal imbalance. Cardiac and respiratory imbalance is also noted in severe cases. AVMs are diagnosed by CT scan- it identifies large AVMs. MRI helps in initial diagnosis. Cerebral Angiography is the last option in difficult cases. Cerebral aneurysms are also diagnosed using CT, MRI, Angiography. ECG, EEG, Lumbar puncture might be done to confirm the diagnosis. Blood tests include Complete blood count with platelets to rule out infection and anaemia. Medical line of treatment for AVMs includes analgesics for pain and anti-convulsants for epilepsy. Surgical line of treatment includes endovascular embolisation, surgical removal and radiation therapy. 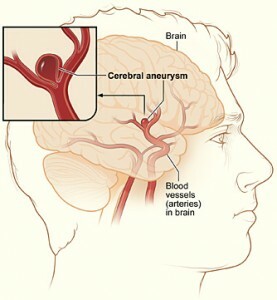 Cerebral aneurysms are treated in the hospital settings with special care given to airway, breathing and circulation. Electrolyte and fluid imbalance need to be corrected. Cardiac monitoring is done. Micro surgery aims at removing the aneurysm from the cerebral circulation and relieving the mass effect on the adjacent structures. AVM is a congenital disease in which there is a tangle of arteries and veins due to weak arterial muscle and absence of capillaries due to which arteies drain directly into veins and thus the veins dilate. There is increased risk of haemoorhage in the brain leading to neurological symptoms. AVM is silent till symptoms of seizure or migraine-like headache occur. Cerebral Aneurysm is a dilatation of small segment of arteries of brain, which is generally either genetic or due to high blood pressure. It could also be caused due to cigarette smoking, alcohol comsumption, trauma or infection in any part of the body especially heart. Aneurysm may rupture causing haemorrhage in the brain which is the major cause of death in these patients. Quick surgical expulsion is required for good prognosis. Basic life support is needed for all patients suffering from Cerebral Aneurysm. rachita. "Difference Between AVM and Brain Aneurysm." DifferenceBetween.net. June 20, 2017 < http://www.differencebetween.net/science/health/difference-between-avm-and-brain-aneurysm/ >. My maternal grandfather and mother passed away from a cerebral aneurysm and 11 hours after my mother passed away her oldest sister passed away from the same thing. On my mother’s side, I’ve a several cousins have aneurysms removed and on my father’s side, his dad had a cerebral aneurysm that left him permanently disabled and a 1st cousin as well. I’ve had 3 neurologist tell me this isn’t hereditary and the closest I came to testing for it was a MRA ordered by my PCP. I was dx’d with MS based off of medical history and a MRI alone. In the report it stated that mini strokes cannot be ruled out and further testing would be needed but none of my neurologists felt it should be and stands by the Multiple Sclerosis diagnosis. I do not believe I have MS and until they rule out the strokes or any other conditions I refuse to take MS medications. Is it possible that white matter or lesions can be caused by AVM or strokes or even aneurysms?